Lucas Duda homered off Trevor Bauer for the game's only run and Ian Kennedy pitched six shutout innings, leading the Kansas City Royals to a 1-0 win over the Cleveland Indians on Saturday in frigid, football-like weather conditions. Duda's shot in the seventh off Bauer (0-1) was one of only three hits by Kansas City and a rare highlight as the teams survived nine innings with the temperature hovering around freezing. Kennedy (1-0) allowed four hits, walked none and struck out eight. The right-hander was only in trouble once, but worked out of the sixth-inning jam. Blaine Boyer and Justin Grimm pitched an inning apiece before closer Kelvin Herrera worked a perfect ninth for his second save. The temperature was 34 at gametime, one degree above the coldest start to a game in the 25-year history of Progressive Field. Players on both teams bundled up, with several wearing hoods under their caps to try and stay warm. 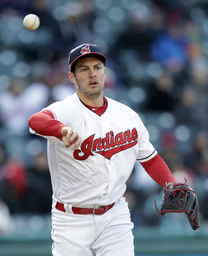 Bauer matched Kennedy and then some, giving up just three hits and striking out six in eight innings. But the Indians, who came in with an AL-low .157 batting average, stayed as chilly at the plate as this unseasonably cold April. Limited to one hit through six innings by Bauer, the Royals took the lead on Duda's second homer, a searing shot into the seats in right field. Duda jumped on Bauer's first pitch, a 90 mph fastball, and drove it over the wall for Kansas City's first run since the Royals scored two in the first inning Friday. Duda is in his first season with Kansas City after signing with the club as a free agent in February. Kennedy gave up a double to Francisco Lindor leading off the sixth, and with one out, Cleveland's shortstop stole third before the Royals starter went into his windup. Kennedy, however, struck out Jose Ramirez and retired Michael Brantley on a flyball to center. Lindor singled to open the eight, but Royals left fielder Jon Jay recovered after initially coming in on the ball to make a running catch on a drive by Jason Kipnis. Bauer held the Royals without a hit through four innings before Alcides Escobar lined a single through the right side with two outs in the fifth. Escobar stole second and took third on catcher Roberto Perez's wild throw - Cleveland's first error this season - before Bauer walked Alex Gordon. Kansas City's center fielder then stole second but was stranded when Bauer struck out Drew Butera on a pitch that had crazy, late movement and caught the outside corner. The inclement weather is nothing new to the Royals, who have had two games postponed already this season - one by snow, the other by cold. "It'd be nicer if it could be a little bit warmer," manager Ned Yost said. "You leave 90-degree temperatures and come and play in drizzle and freezing cold temperatures for two weeks, it's not a lot of fun." Indians: Brantley, who is recovering from offseason ankle surgery, will likely sit on Sunday as the team remains cautious in the early stages of his return. ... RHP Danny Salazar, on the disabled list with shoulder tendinitis, has not been cleared to throw at full intensity in his bullpen sessions. ... 3B Giovanny Urshela (hamstring) is making progress and could be playing in minor league games within a week.